Why has it been updated? In summary, TSCA authorizes the EPA to keep an ‘inventory’ of all existing chemicals. Currently, the inventory comprises approximately 85,000 chemicals manufactured or imported into the US. The scope of the reform does not include; pesticides, tobacco, nuclear materials, food, drugs or cosmetics. Learn more by reading our informative "Safety First - your guide to TSCA" ebook. EPA will prioritize the inventory into an ‘active’ list and an ‘inactive’ list. EPA will identify all active substances by asking manufacturers to notify them of all chemicals used in the ten year period prior to 22 June 2016. Chemicals that are not notified will be considered to be inactive. These chemicals will remain on the inventory and if a company wishes to resume manufacturing of that chemical they will need to notify the EPA, and the chemical will be moved to the ‘active’ list. The next step is the ‘prioritization screening’ process. All active substances will be evaluated as ‘high’ priority or ‘low’ priority. High priority chemicals are those that are highly hazardous, and or present an unreasonable risk of injury to human health or the environment. The next step is the ‘prioritization screening’ process. All active substances will be evaluated as ‘high’ priority or ‘low’ priority. Low priority chemicals are those chemicals the EPA considers to meet the safety standards under intended conditions of use and thus are not likely to present an unreasonable risk of injury to human health or the environment. These evaluations will be done using existing/available data. During this phase, the EPA will not be able to request manufacturers to submit additional data, however lack of data would enable the EPA to designate a chemical as high priority. The next stage will involve the EPA conducting safety assessments of all high priority chemicals and for those chemicals requested by industry; a safety determination of whether the chemical poses unreasonable risks of harm to human health or the environment. Low priority chemicals do not require further action but can be elevated to high priority based on new information. Safety assessment evaluates risk, whilst safety determination evaluates whether a chemical meets the safety standard. Both of these processes are risk based. Risk is based on hazard and exposure. EPA will evaluate both the hazard of the chemical and the extent to which humans or the environment are exposed to the chemicals. This assessment will be science based and if insufficient information is available, the EPA can request manufacturers to provide more data or testing. If the EPA determines the chemical does not meet the safety standard under intended conditions of use, it will initiate a risk management strategy. These range from warning labels, to production limits, to banning certain uses of a chemical. This will also consider the cost and benefits of using the chemical, and of any relevant alternatives, and the EPA will not be obliged to select ‘least burdensome alternative’ as with the previous act. 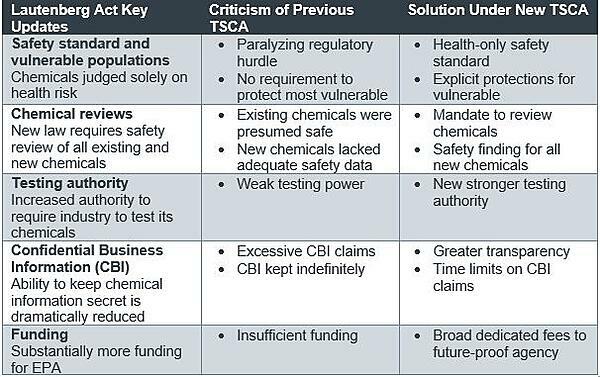 Under the revised act, the EPA will conduct risk evaluations for ten of the chemicals on the 2014 TSCA work plan, (see prioritized chemicals below). EPA must expedite review of those chemicals, so within three years EPA must propose a rule to manage the risk of these chemicals. Therefore, thousands of chemicals previous unregulated will now be regulated. Manufacturers cannot produce a new chemical until the EPA approves it following a pre-manufacture notification (PMN), and EPA has 90 days to do this. EPA must provide affirmative decisions on new chemical or significant new use notifications (SNUNs) of existing chemicals before the chemical can enter the market. Depending upon the outcome, the EPA may take a range of actions, including placing a ban on the chemical or request additional data or testing of the chemical. Manufacturers will need to review the TSCA work plan list and submit to the EPA information on chemicals that are active. In addition, PMN and SNUN submissions will need to be presented immediately. Industry should be proactive in providing information to the EPA and comment early on the scope of the assessments. Also, there is a need to review the EPA databases, to understand whether the data is sufficient and identify any data gaps. The TSCA Reform implements a new requirement on the use of animal alternatives and read across approaches. Chemical organizations could be forgiven for thinking that their requirements under TSCA are far less onerous that those which were seen under REACH. There will be less demand for safety testing due to the increased push for data sharing across global systems however, there will still be an acute need to carefully analyze and interpret the vast amounts of data to ensure compliance and consumer safety. In these circumstances, it’s important for organizations to partner with a regulatory consultancy that really understands the context of the data against the relevant regulations and can help identify any potential gaps to minimize the risk of rejection by the EPA.